We use the C-Mill VR mainly for fall prevention therapy of geriatric pathologies or to provide insight into inadequate compensation strategies due to (active stability) problems during standing and/or walking. The C-Mill VR is integrated as part of our therapy in our private outpatient practice. Below, our clinical setting is described and I hope that it serves as an example to support other clinics that also work with the C-Mill VR. Our patient group is very diverse, mostly geriatric patients, such as elderly with comorbidities, total hip or knee prothesis, osteoarthrosis, stroke, or Parkinson’s disease, but also children or younger patients with general problems of the musculoskeletal system. We are a private outpatient practice which focuses mainly on making patients self-reliant by creating insight into their own health condition. Our emphasis is to seek for the highest level of personalized one-on-one care. We have close connections to the general practitioners, psychologists and dieticians (all located in the same building). In addition, we schedule a weekly team meeting, with patient cases as the mean focus. 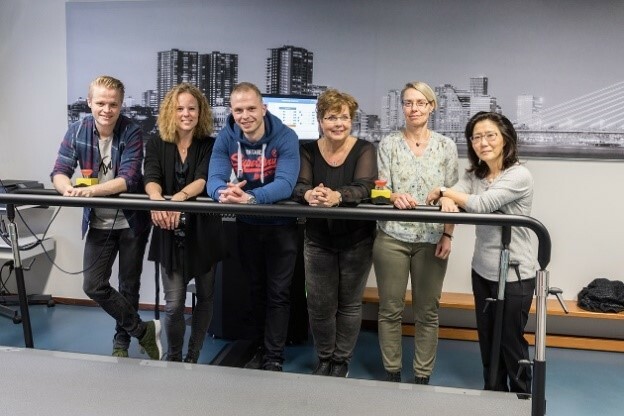 For our geriatric patients, the treatment goals with the C-Mill VR are focused on gait adaptability and fall prevention by simulating activities of daily life e.g. avoiding obstacles, crossing obstacles, making adequate adaptive steps and to be able to accelerate or slow down. We use guidelines, e.g. for osteoarthritis or intermittent claudication, to determine a patient-specific therapy plan. The therapy plan always includes functional treatment goals of the patient (such as wanting to hike, to shop or to climb stairs) to consider their independence in daily life and physical performance. However, C-Mill VR specific therapy goals are also included into the therapy plan. The C-Mill VR is located in a large fitness room where also conventional therapy takes place. The location of the C-Mill VR and the C-Mill VR specific goals are meant to integrate the C-Mill VR more into our practice. We apply C-Mill VR therapy as part of balance or gait training to the patients, as far as no contraindications are found. Moreover, there is no special assessment to determine whether the patient is indicated on the C-Mill VR. The responsible physical therapist decides which patients benefit from C-Mill VR therapy. 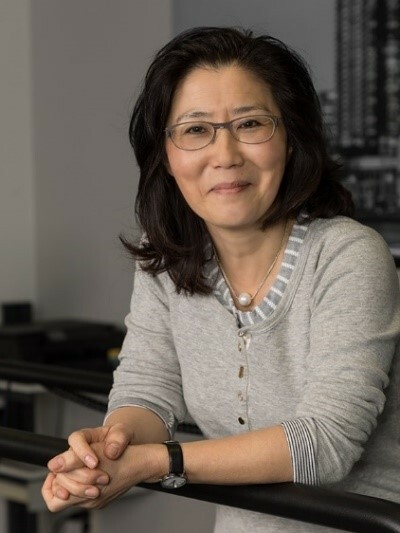 Due to a recent internal promotion, by giving a C-Mill VR workshop, we receive more often C-Mill VR-specific referrals from generel practicioners and podiatrists for a walk analysis. The duration of a regular therapy session is 30 minutes. The duration of each C-Mill VR session is between 15-30 minutes, in addition to conventional therapy. Patients receive C-Mill VR therapy one to three times per week depending on the therapy goals and the availability of the C-Mill VR. The total duration of the regular therapy is -/+ six weeks, depending on the patient’s functional progress. 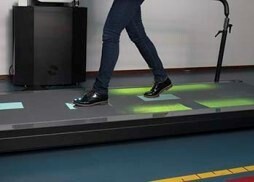 However, in some cases the C-Mill VR is only used for gait analysis, to provide patients insight into their own movement pattern and to monitor changes. Our central therapy scheduling system is also used to reserve the C-Mill VR, for blocks of 15 or 30 minutes. The C-Mill VR gait analysis consists of a video analysis and walk assessment, which is a commonly used method. The gait parameters analyzed are stance duration, distance and speed. 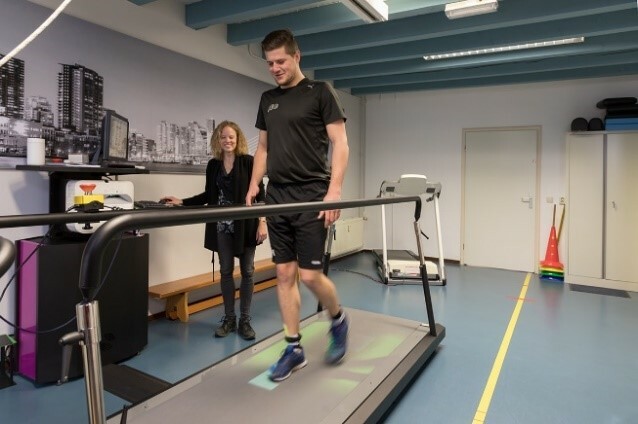 In combination with video analysis, this will be used as feedback of the patient’s gait pattern during the training and to monitor the patient’s progression over time. This has a highly motivating effect on the patient. The C-Mill VR is very suitable for fall prevention training. Elderly often show actions that are potentially fall hazardous. They make, for example, an inadequate adaptive step in response to an obstacle. The C-Mill VR can easily and safely show the danger of this action through video feedback, floor projection and a safety harness. In addition, making a problem or compensation strategy transparent to the patients with the C-Mill VR through assessment results, is very valuable. They understand better why certain patterns or problems arise. The C-Mill VR is innovative and has a profiling effect on our practice. A future goal for our practice is to offer a comprehensive report with different assessments. The report will be interesting for athletes, based on a C-Mill VR gait analysis, running analysis and physical performance test using a bicycle ergometer. First, we need to explore which complementary devices might be beneficial for our practice. The team consists of five physiotherapists with a lot experience in e.g. geriatrics, sport-specific complaints and oncology. We would like to have a yearly C-Mill VR user day or workshop to share our experiences with other C-Mill VR users. The C-Mill VR analysis or C-Mill VR therapy do not have a separate billing code and will be covered under the regular physiotherapy. This clinical experience report is meant to serve as an example of how the C-Mill VR is integrated into one particular rehabilitation center. It is not necessarily a standard recommendation from Hocoma.